I love Indian food, but I hardly ever order it out at a restaurant because it's very hard to know which entrees use ghee and which use vegetable oil. There is a small Indian market near my house and I sometimes will drop by on my way home from work and order their Chana Masala and Vegetable Biryani (both are made fresh daily and use vegetable oil), along with a couple of their potato and pea samosas. Now, I normally don't eat fried food, but every now and then, I can't pass up a good samosa. I learned how to make samosas while working as a Chef in 2008. We had a 200 person dinner party and they requested 25 platters of samosas as one of their appetizers. I only had about three days before the party to make 500 samosas and so I was panicked to say the least. But the wife of my husband's co-worker came to my rescue and gave me a quick lesson, along with her delicious recipe and I have been happily making samosas ever since. And they were such a hit that we placed them on the menu permanently. Making the dough couldn't be easier (it includes, a/p flour, vegetable oil, water and salt) and once you get the hang of rolling and stuffing the samosas, it goes by very quickly. 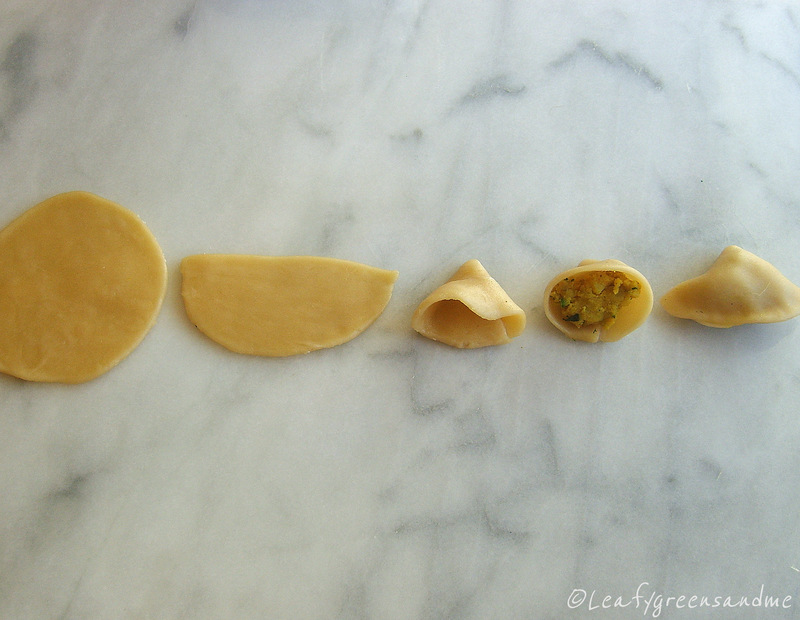 A good samosa dough should puff up with little bubbles when fried and be crispy out the outside--never greasy or soggy, even after sitting out at room temperature. The filling for the samosa should be fluffy, spicy and flavorful. I have never tasted a filling that compares to the recipe that she shared with me. I use russet potatoes, green chilies, ginger root, garlic, amchur powder, turmeric powder, red chili powder, garam masala, crushed coriander seeds, chopped fresh coriander (cilantro) and sea salt. And I always serve my samosas with a cilantro-mint sauce and tamarind-date chutney. 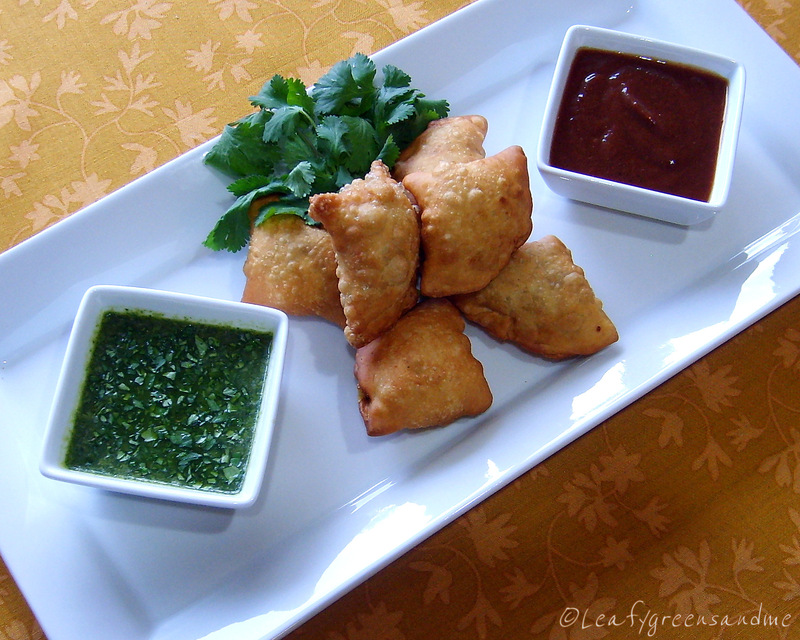 Both sauces provide a nice contrast (sweet and cooling) to the spicy samosas. Too bad that samosas are deep fried or I would probably eat them everyday! But once or twice a year seems to satisfy my craving and all is good in the world, or at least in my kitchen! Nice blog,i like its.Thank you.